Each eight-tab pre-collated set includes seven of the most popular medical index titles used today, plus one writable tab. Made of sturdy 90 lb. stock. Tabs are reinforced with tear-proof colored Mylar. Tab titles include: Correspondence (orange), History & Physical (blue), Hospital (red), Insurance (brown), Lab/X-Ray (green), Miscellaneous (pink), Progress Notes (yellow) and white writable blank tab. 3/8" tab extension. 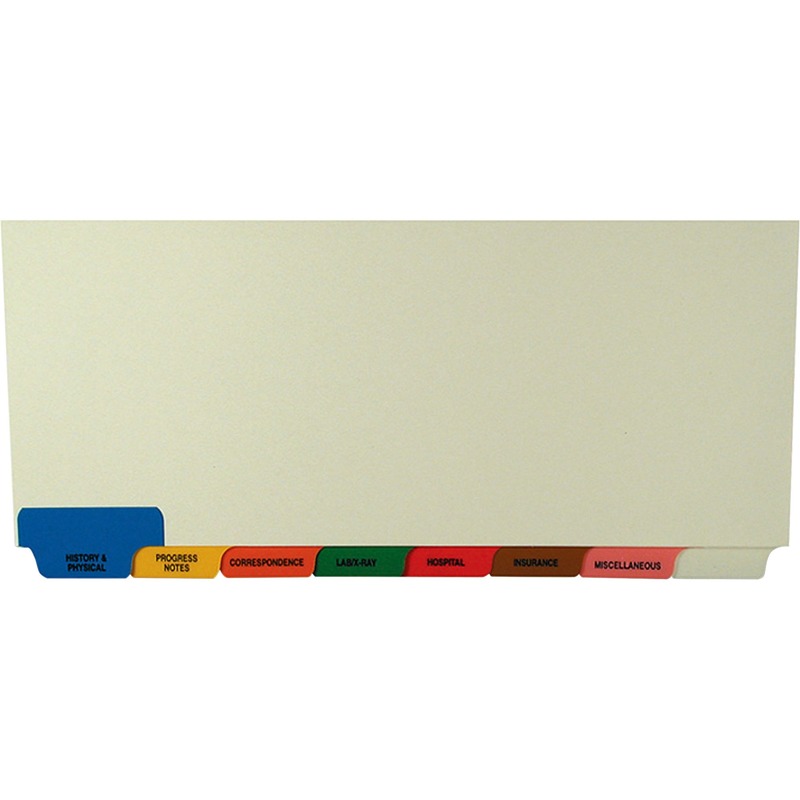 Tab Style: 8-Tab; Tab Color(s): Assorted; Index Divider Size: 8 1/2 x 11 3/8; Form Quantity: 40. Each eight-tab pre-collated set includes seven of the most popular medical index titles used today, plus one writable tab. Made of sturdy 90 lb. stock. Tabs are reinforced with tear-proof colored Mylar. Tab titles include: Correspondence (orange), History & Physical (blue), Hospital (red), Insurance (brown), Lab/X-Ray (green), Miscellaneous (pink), Progress Notes (yellow) and white writable blank tab. 1/2" tab extension. 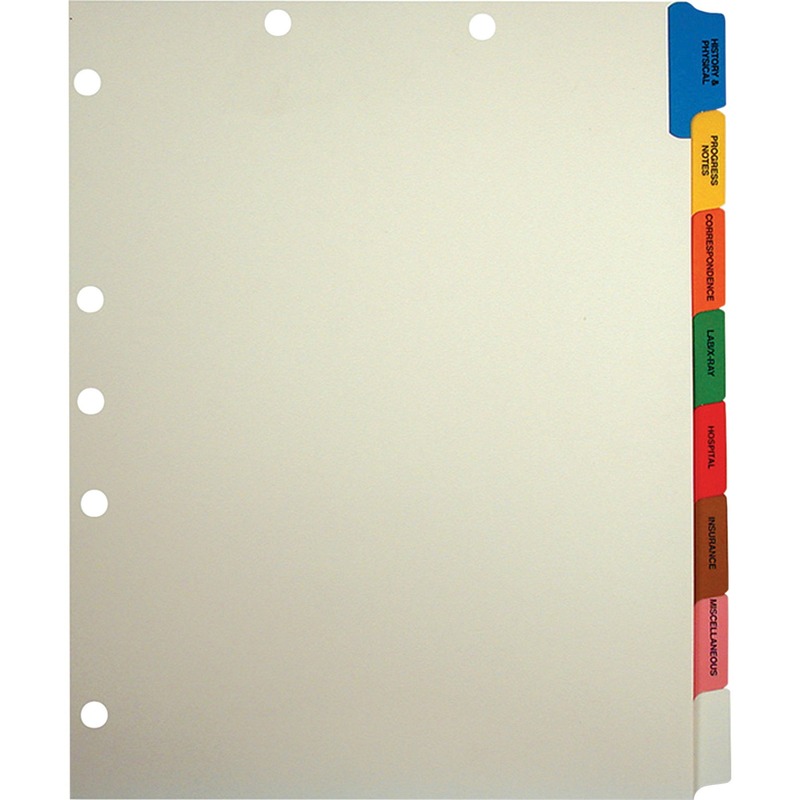 Tab Style: 8-Tab; Tab Color(s): Assorted; Index Divider Size: 9 x 11; Form Quantity: 40.